Tampa cruise port is quickly becoming one of the premier ports in the state, if not the country. At only 9 miles from Tampa airport, and an hour’s drive from Orlando and all of the Disney Parks, it is ideally situated and easy to access from the state’s impressive highway system. Its state of the art amenities, modern lines and Channelside, a complex at the port full of dining, shopping and the Florida Aquarium, not to mention an IMAX theatre, all make Tampa cruise port a destination in and of itself, and a great place to start your cruise. If you are on a Carnival Western Caribbean cruise or simply taking a dinner cruise from Tampa, the cruise port offers passengers full amenities, special information areas and plenty to do for everyone in your party. Passenger drop off spots make it easy to unload before you park your car and the whole process of embarking on your cruise is efficient and well thought out. Tampa cruise port parking is on-site and monitored as well as fully insured, so you can relax on your trip knowing your vehicle is safe. The terminal parking is either valet or self-parking, giving you the choice of seeing your car to its spot or leaving it to the experts. Claiming your car after the cruise is also a hassle free experience, allowing you to get on your way fast. 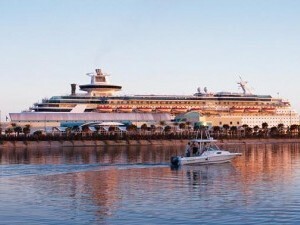 As most passengers enjoying the Tampa cruise port are from out of town, it stands to reason that they would choose to stay at a hotel either the night before or the night after their cruise. Several hotels in the area offer special ‘snooze and cruise’ packages, like the Chase Suites Hotels or the Comfort Suites that combine a room for one night with complementary parking and a free shuttle to and from the port. The Courtyard Tampa/Brandon offers guests parking for up to 14 days and the shuttle which is great for those longer cheap cruises from Tampa that are so popular. The Crowne Plaza has a cute name for its cruise package, with the ‘Bon Voyage Tampa’ deal that allows you parking, a room and shuttle service all from just $139 per night. Most hotels require a few days’ notice of your arrival and departure plans and some of their shuttles have limited hours, so it’s best to check before you go to ensure your needs fall between their operating times. Whether you are on a 3 day cruise to Mexico or an 8 day excursion to ports in the Caribbean, the Tampa cruise port will get you to your ship in a timely manner allowing you to spend more time on ‘vacation’, stress free.